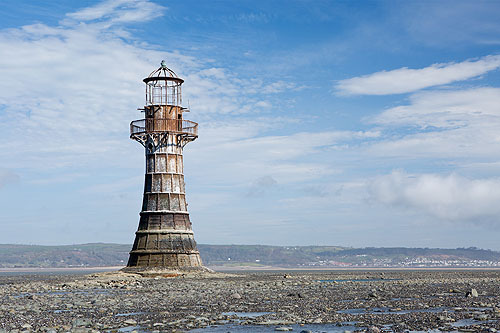 Whiteford Point Lighthouse is an unusual cast-iron lighthouse built in 1865 to mark the shoals of Whiteford Point in the Loughor(Burry) Estuary. It is the only wave-swept cast-iron tower of such a size in Britain and at high tide stands in over 6 metres of water. The tower is 18.6m (61ft) high and made up of 105 bent and tapered cast-ironplates bolted together externally with cast-iron bolts weighing 2 lbs each. With a wrought iron balcony , it also retains parts of its early copper-sheeted roof and non-ferrous glazing bars. Provision was made for two lighthouse keepers. The Light was discontinued in 1921.